Mar. 29, 2016 12:00 p.m.
With the days becoming longer and the weather warming up people now have the option of spending more time on their patios or in their yards. Outdoor living has become very popular, said Jan Lavertu, owner of the Port Alberni Home Hardware. Other than having a comfortable place to hang out, Lavertu said adding a pop of colour is a great way to spruce up your outdoor living area. Colourful pillows, flowers and a painted door are popular ways people are brightening up their decks this year. Another way to brighten up your outdoor surroundings is by adding lighting to the area. Another popular way to do-it-yourself, Lavertu said, is by finding old furniture and refurbishing it with chalk paint. “We’re the only store in North America that has tinted chalk paint so we can customize your chalk paint to whatever colour you want,” Lavertu said. Growing your own produce is becoming more and more popular, Lavertu said, and is something he’s seeing sprouting up more throughout people’s outdoor living areas. Lavertu said many people are using raised garden beds which make a smaller footprint because you only water what you use. “Vegetables aren’t cheap so I think that’s where we’re going to see a lot more trends… people on their decks growing herbs,” he said. 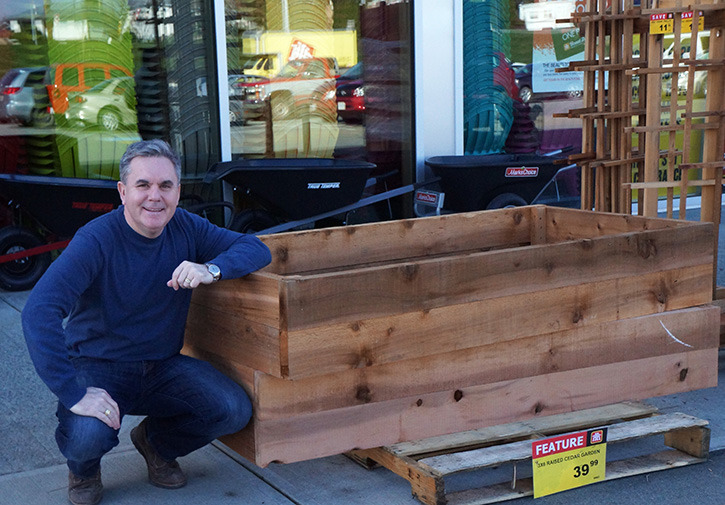 Kevin Smith, owner of Canadian Tire in Port Alberni, agrees that backyard living has taken off in the past couple of years and that more and more people are spending money tricking out their outdoor space. Smith said customers come in constantly to look for “finishing” items to enhance their outdoor spaces like living sets, barbecues and lighting. In terms of outdoor cooking, Smith said charcoal is making a comeback. Another thing that is really popular is using propane appliances, Smith said. Because of strict fire regulations in the Alberni Valley during drought conditions last year people are going to propane because it’s allowed.